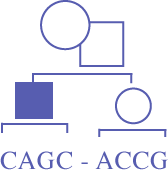 The mission of the Canadian Association of Genetic Counsellors is to promote high standards of practice, encourage professional growth and increase public awareness of the genetic counselling profession in Canada. Looking for a Genetics Clinic in Canada? This year's conference will be held in Winnipeg, Manitoba September 11-14, 2019. Congratulations to CAGC member Prescilla Carrion, who was nominated for a “Code Talker” award to recognize the impact she has made through the psychiatric genetic counselling research she is leading in the Institute of Mental Health Centre for Care and Research, in the UBC Department of Psychiatry. There are many great benefits to being a member of the CAGC, including advocacy, networking opportunities, resources for your practice, job opportunities, and continuing education. CAGC Featured project, grants and awards. Women’s experiences with genetic counselling for a positive prenatal screening result for Down syndrome in a group setting compared to traditional one-on-one counselling. genetic counselling from a recognized university program. as well as challenging professional circumstances.